Americans spend 50 percent of our waking hours devoted to work. You are a person of vision and dreams. You desire to put your best foot forward at your job; you need to excel. You yearn for something special and great from your life. You want to foster growth and to improve. Allow me to explain. In preparation of fostering growth, the Chapter and Verse: Daily Devotions for Your Work Week title may have grabbed you, provisionally motivating you to want the most out of your job and benefiting others too. That’s the honor and satisfaction that comes with being rewarded from a job well done! Increase your eligibility with a download of Chapter and Verse and further receive God’s blessing and favor in your life. As you will see from viewing the video at: https://youtu.be/-534cq9gX64, the blessings would be major. Your typical work week behavior will begin with an immediate ‘Thank God It’s Monday’ versus the 'Monday Morning Blues,' continue with feeling a buzz of excitement to go to work EVERY WORK DAY, and finish– well, actually, bring you the real joy experienced at the end of your work day on Friday each work day! RESPOND TO THIS OFFER to validate your PROVISIONAL interest that will drive you to achieve real happiness in your job and propel you from average to awesome! This will make your transfer to ‘Every work day is a Friday’ COMPLETE. Please don’t delay. Without a response, all that you have ‘toiled to achieve may be chasing after the wind and meaningless' ... and your opportunity to be inspired by daily devotions that’ll help push you across the finish line for your work week will be lost. Your response to this offer is needed today to help find greater satisfaction in your job. I urge you to download your copy of Chapter and Verse now and become a living witness at work, enabling others to see Godly character, heartily work, excellence, and leadership through you. You viewing this offer shows you want to win. And remember, work is of no value except when God is in it. Then, and only then, are you in an improved position to become a better ambassador for Christ while on the job and be amazing! GREAT NEWS! THIS OFFER HAS BEEN TAGGED WITH A SPECIAL BONUS! Requesting your copy of the transformative Chapter and Verse means you are approved for an award of a Super Bonus – ‘5 Powerful Prayers from the Bible to Incorporate into Your Time with God’ that adds to producing a job well done. HURRY! 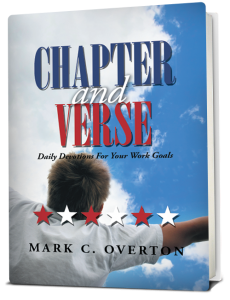 Request your copy of Chapter and Verse today!